Hotlink Automatic Splice (HAS）Rated to hold a minimum 95% of RBS of the strand used, can ensure quick and reliable overhead tension splice with fast and easy installation. This parts mannufacture at china mainland and We will help to distribute it to all over the world. Type HSA Wide Range Automatic Tension Splice For ACSR, AAAC and AAC Conductors. A. Select the proper automatic ATS wide range splice for the job. Wire size and type are clearly marked on the splice. The ATS splice is recommended for use on the ACSR, AAAC and AAC conductors and is color-coded for the range of conductor size it accommodates. B. Straighten conductor to remove any curvature. C. Old Conductors should be cut back sufficiently to remove stretches, burned or annealed strands. D. Cut conductor square so that all strands are even, in lay and free of burrs. E. Measure the conductor for full insertion and mark with tape or other device which clearly indicates insertion distance (one half the length of the splice). See figure 1. G. ACSR conductor only: The portion of the ACSR stranding to be inserted into the automatic connector should be thoroughly cleaned with a good quality aluminum conductor cleaner. ( See caution 4, back page). wiped off. It is also recommended to wire brush the inhibitor coated conductor once again to assure all the oxides have been removed and inhibitor reaches between the strands. A. Do not remove the plastic strand guide or internal pilot cup. These components confine and guide the conductor strands for easy insertion. See figure 2. B. Insert conductor into splice with a smooth straight thrust through the jaws until conductor hits center stop. DO NOT TWIST. Do not push conductor partially in, pause and then continue. Insertion must be accomplished with one continuous thrust. Check markers for full insertion. 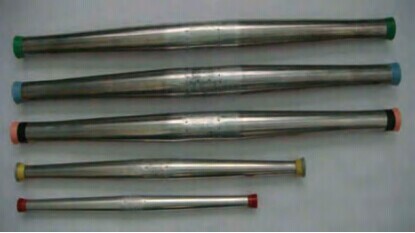 If insertion is not complete, conductor will not be gripped and will pull out easily. See figure 3. C. Before releasing blocks, apply a momentary “hand set” tension to assure proper jaw gripping. See figure 4. 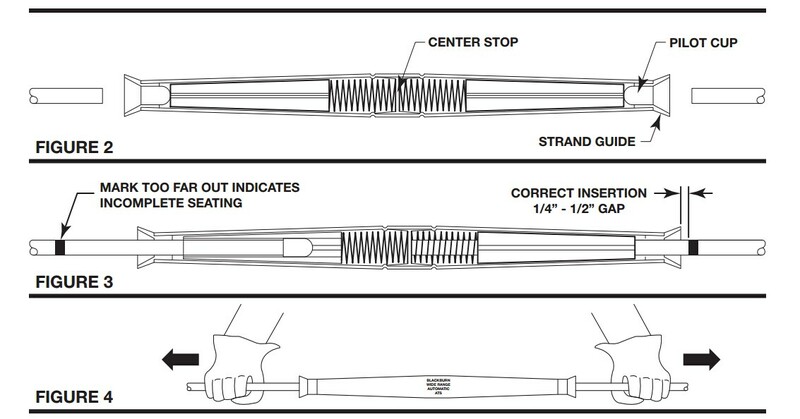 As tension is applied, the conductor will move 1/4 inch to 1/2 inch from the end of the splice due to the sliding action of the gripping jaws. This is normal. DO NOT TAP THE SPLICE TO SET JAWS. This entry was posted in Hotlink Automatic Splice and tagged AAAC Conductors, AAC Conductors, ACSR Conductors, Automatic Splice on May 28, 2014 by Ameisina. Hotlink Automatic Splice-For ACSR, AAAC and AAC Conductors. ensure quick and reliable overhead tension splice with fast and easy installation. The conductor simply slips into color-coded, funnel-shaped end piece and enters the pilot cap automatically with a simple push. The pilot cap guides the conductor pass the set of serrated jaws and into the center of HAS. HAS are used on ACSR, AAC, AAAC conductor for an instant, positive and automatic connection, ANSI C119.4 Full Tension Class A connector. conductor into right position for insertion. pass serrated jaws and into splice center. proper insertion length of conductors. for superior corrosion protection and lasting service life. eliminate potential for errors during installation. This entry was posted in Hotlink Automatic Splice and tagged AAAC Conductors, AAC Conductors, ACSR Conductors, China Wholesale, Hotlink Automatic Splice on May 26, 2014 by Ameisina.